My interest in art is broad, and I tend to define my work by ‘problems’ rather than specific media. By that I mean that concepts, which are often a response to a question or ‘problem’, generate the form and materials in my work. 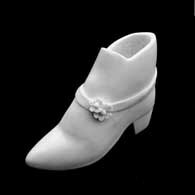 My series of marble shoes, for example, arose from the larger ‘problem’ of how to represent the human body as a historical phenomenon. I decided to show only the shoe, carved in statuary marble, and because I am not a stone carver, I made a special effort to learn that process. My teaching of art at Wake Forest is a reflection of the interests that drive my work. I began making work for public sites (starting with murals! ), and over the years most of my subsequent work has had a public component. I like art that is enmeshed in activity and places, art which responds to location and history. In 1994 I started a class in Public Art (Art 215) for students to experience making a work with and for a campus or community organization. My own Public Art projects have been for towns, schools, community centers and a library, and to do the projects, I have had to learn a variety of fabrication techniques such as carving, casting, welding, and sewing. These form the basis for Art 216, Sculpture Fabrication, in which students concentrate on learning and applying crafts to art. Another long standing interest I have is with the body as a central form in sculpture practice; my installations in art spaces of the collaged Masked Figures and Newspaper Children were part of the 1980s art scene in NYC. 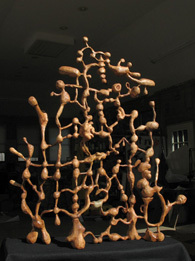 My work with the body formed the basis of Art 225, Bodies and Objects, an inquiry into the use of the body in art practice, and Installation Art (226) in which the class is given a space to create a series of installations. I don’t see a priority or sequence for these aspects of sculpture, so they are open to all who have taken the basic Introduction to Sculpture (Art 115) course. Based on my work in with public art and design, I began teaching a general design course, Art 296, Design Studio: Ethics and Aesthetics. Students in the design studio work on problems through framing, research, exploration and prototyping, and become familiar with the overall process used by designers. My interest in teaching is wide, and ranges from technical tools to what to do after college, from studio-seminars to extracurricular projects. In all my teaching I want to demonstrate the power of visual art to synthesize and communicate knowledge and feeling on the deepest level-- and then inspire you to do the same. While I don’t think that art can be taught (it is not a specific technique or even a defined body of knowledge! ), I can partner with, or ‘coach’ the student in the search for creative pathways. Making art takes persistence and hard work; it calls upon a range of abilities, manual and intellectual, and constantly demands a tolerance for ambiguity. Art is demanding, but the skills you develop as an artist in problem solving will help you to be more creative in all walks of life. Newspaper Children, 1989, detail of installation, Glasgow, Scotland.